One of the scariest, and most impressive, effects at haunted houses are ghost illusions, in which spectral bodies or heads appear to float right in front of you. While this trick, also known as Pepper's Ghost, is the secret behind the ghosts at Disney's Haunted Mansion, it is actually very easy to create yourself. The illusion can be done in a front window to spook people who come to the door, or it can haunt any room of your house. 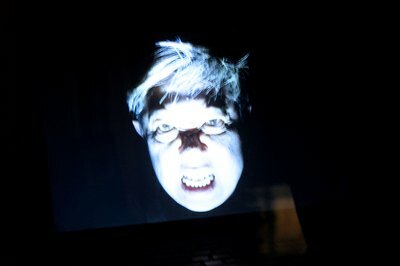 First, you'll want to create a video of a ghostly head. Stand in front of a backdrop of black fabric, and wrap more black fabric around your body so only your head is showing. 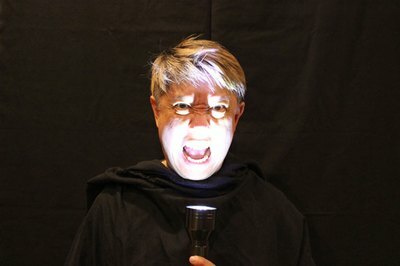 Position a flashlight under your head and shine it up at your face. Turn off the room lights and turn on the video camera. 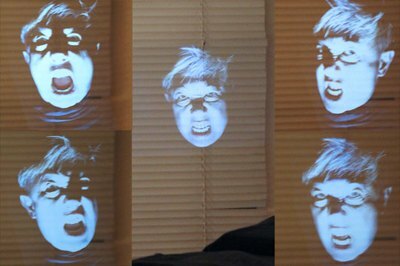 The extreme shadows created by the flashlight will make your face look absolutely diabolical. Be sure to move your head from side to side while filming so the ghost effect has a lot of movement. This illusion works really well in a doorway, so people can be spooked as they walk from room to room in your haunted house. 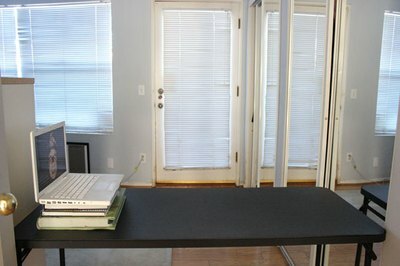 Place a table at the doorway, and position a laptop or TV monitor to the far left, so that the screen is facing right. It is a good idea to place the screen on a stack of books so that the ghostly image will be higher than table top height. They key to this illusion is reflection off of a clear surface, which is where the plexiglass comes in. Plexiglass in a picture frame is easier to handle than a plain sheet of plexiglass, and you probably have one around the house. 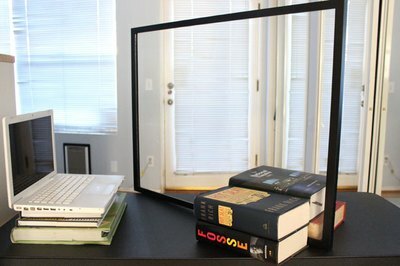 Position the plexiglass at a 45 degree angle from the laptop or TV screen. Secure the frame in place with stacks of heavy books on both sides so it doesn't fall down. Turn on the video, and you will see the ghostly image reflected in the glass. Adjust the plexiglass or laptop as needed to get the ghost image exactly where you want it. Cover the books and laptop keys with black fabric, so these tricks of the trade are concealed. 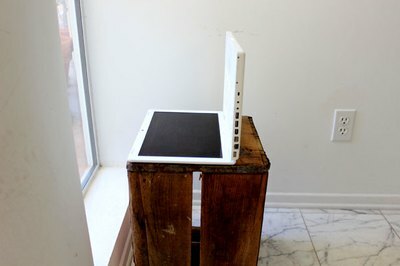 Frame the doorway with more black fabric to conceal the edges of the plexiglass frame and the existence of the laptop screen. 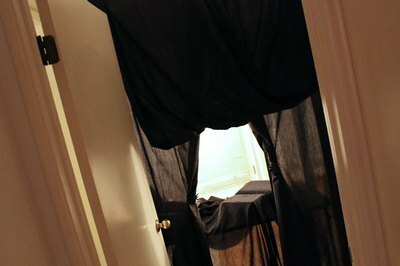 You can hang the fabric with a tension rod in the doorway, or with push pins. Play the video, and the ghost appears between the curtains. Play with the lighting in the room; if the room is dark, visitors will only see the head. But when there is light, it can actually be spookier, as the head appears to be floating in the room. 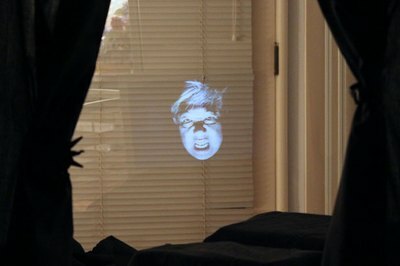 If you're creating the ghost illusion in your front window, the concept behind the trick is the same, but the positions of the laptop/TV monitor and plexiglass are different. Place the monitor on its back with the screen facing the ceiling. Place it on a stack of books or a crate to raise it up so the ghost image will be higher and more visible. 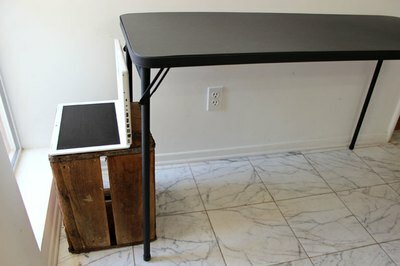 Place a table behind the laptop. Make sure that the table does not block the video screen as it points toward the ceiling. Position the plexiglass above the video screen, leaning the top of the plexiglass against the window or window frame, and holding the bottom of the plexiglass steady with a heavy brick so it doesn't slip. 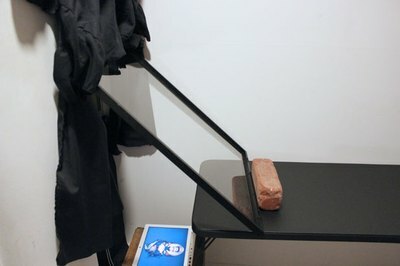 The plexiglass should be angled about 45 degrees, but check outside your window to see where the image is, and make adjustments to the height of the laptop screen and angle of the plexiglass until you're happy with where the phantom head appears. 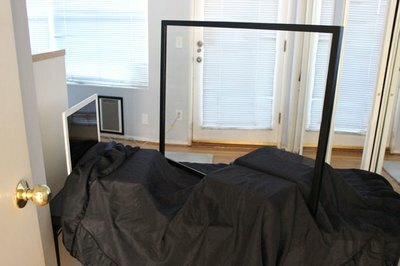 Hide the laptop, table and plexiglass frame by hanging black fabric on the window, without covering the reflected ghost image. You can also cover the table and brick with more black fabric, but if your interior house lights will be turned off, they probably won't be seen anyway. Placing this illusion in the front window involves reflections that might interfere with the ghostly image, like lights from the front yard. Therefore, try turning off any lights that reflect onto the front window glass. Turning off the interior lights near the front window will also help reduce glare. Now, get ready to scare everyone in your neighborhood. And keep telling yourself that the ghost image is only a trick of the eye – if that will help you sleep at night. Muahahahaha.